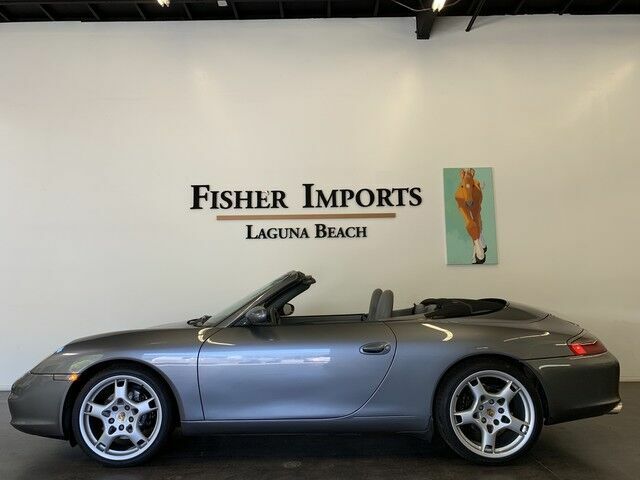 YOU ARE VIEWING AN IMMACULATE 2002 PORSCHE 911 CARRERA CABRIOLET! California Car Its ENTIRE Life!!! FRESH IMS, REAR MAIN SEAL, 60K MILE SERVICE, BRAKE PADS & ROTORS DONE ON 3/26/2019!!!!! ($4000 !!!) ! $93,540 ORIGINAL MSRP (WINDOW STICKER) ! SEAL GREY METALLIC OVER GRAPHITE GREY ! FULL LEATHER ! SUPPLE LEATHER ! 18" HOLLOW SPOKE TURBO TWIST WHEELS IN CHROME ! PSM (PORSCHE STABILITY MANAGEMENT) ! COMFORT PACKAGE ! ADVANCED TECHNIC PACKAGE ! BLACK TOP ! IMMACULATE CAR INSIDE AND OUT!!! INTERIOR PRESENTS NEAR NEW! DRIVES LIKE A NEW CAR ! JUST 56K MILES !!!!! STOCK CHROME TURBO TWIST WHEELS COME STANDARD WITH THIS VEHICLE. UPGRADED 997S WHEELS ARE OPTIONAL AT ADVERTISED PRICE. PLEASE CONTACT FISHER IMPORTS LAGUNA BEACH AT 949-715-8988. FINANCING AVAILABLE. WE ARE HAPPY TO ASSIST WITH THE ARRANGEMENT OF TRANSPORT.